We woke up this morning to the sound of rain. So much for the hot and dry Northern California stretch. Laurie’s mom was outside our tent at 6:30am encouraging us to get up and join her in the RV. It’s hard to motivate and get out of a tent when it’s raining. The rain subsided and we rallied. Packing up a wet tent is no fun, but we’re hopeful to dry it at some point this afternoon. Today’s is Andy’s 33rd birthday. To celebrate Laurie and Sue wrapped up a tin of sardines in a hand towel and presented it to him. Andy really likes sardines and was excited to have them for dinner tonight with his buckwheat. Sue made oatmeal on her stove which we all devoured. 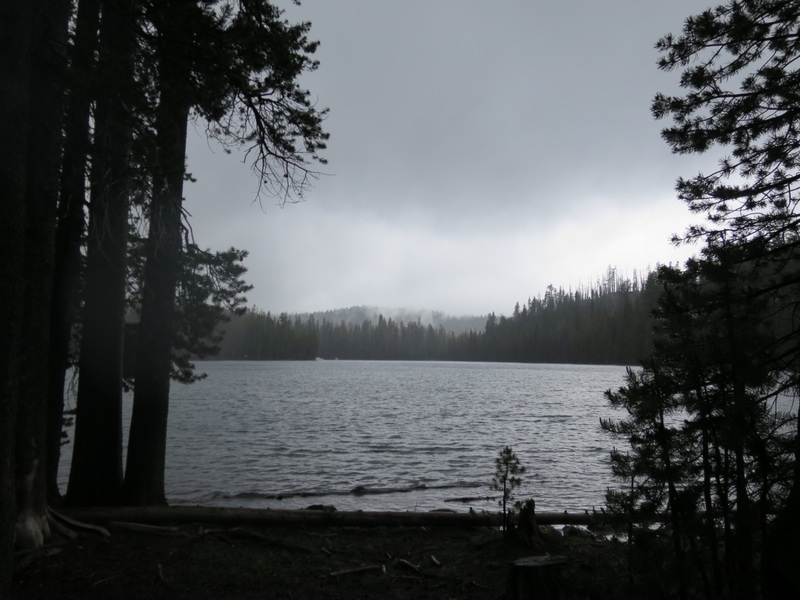 It was quite nice hanging out in the RV on a gloomy morning, but alas, the trail beckoned. We were out and hiking by 8am. 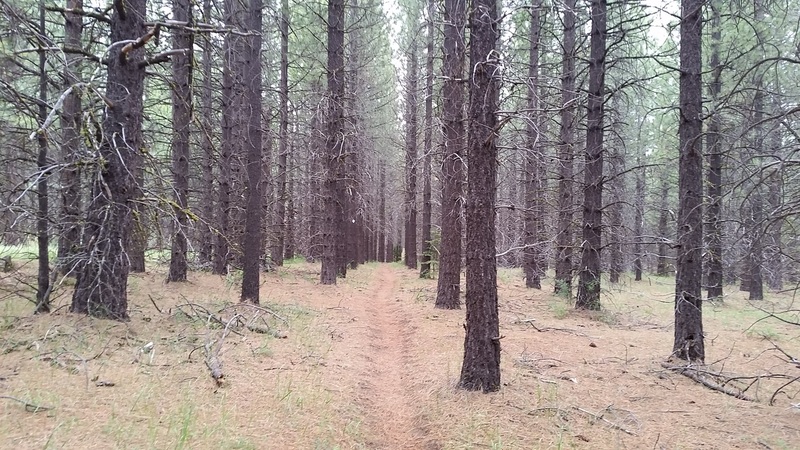 The trail switchbacked up and up immediately, providing great views of Lassen National Park. Laurie and Sue usually hike with their heads down but Andy is the opposite – always looking up and around. Andy noticed something odd up on the cliff above the trail. He took another look after a few steps. Ears? Could it be a dog? No, they aren’t allowed on National Park trails. The creature lifted his head and it was clear. “Bear” he exclaimed to Laurie and Sue, who walked back to catch a glimpse of the small, blonde bear. It was as curious about us as we were fascinated by it. It was bigger than a cub but a third of the size of an adult bear. 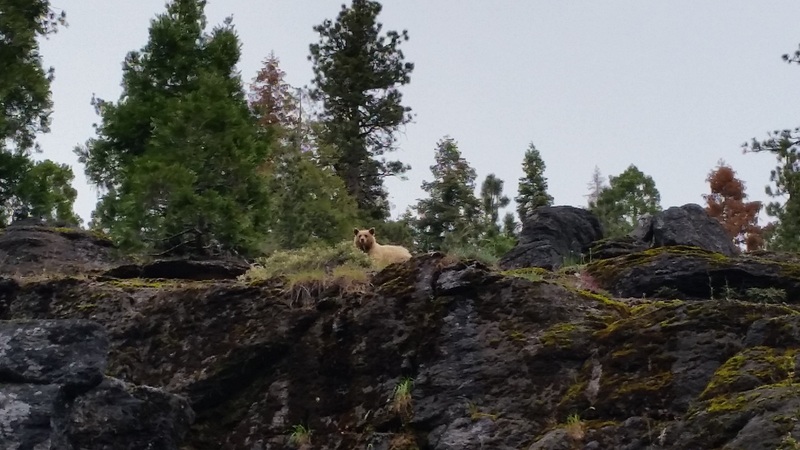 It was the first bear we’ve seen on our hike! We continued to switchback up the mountain side. 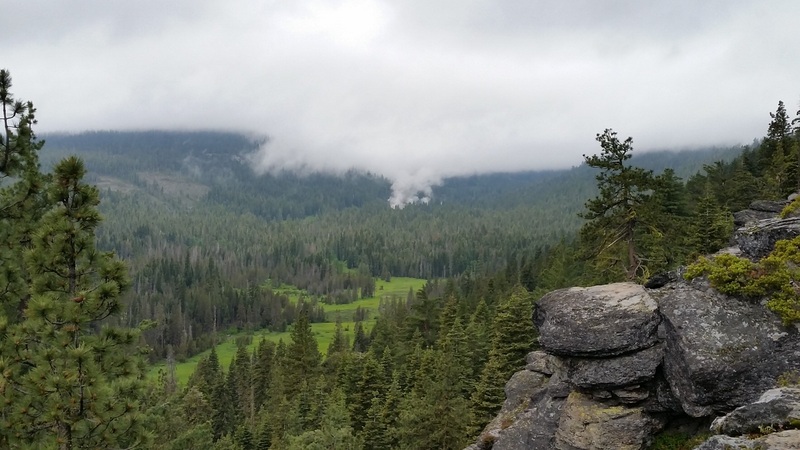 In the distance we could see the steam from geysers and lakes, hanging low in the trees like clouds. It was beautiful. Sue hiked with us for another mile before turning around. We hope she made it back to the campground before the rain started. She’s got a long drive ahead of her and we hope to see her in Old Station tomorrow! The trail descended another 400 feet to a meadow. Around 9am the rain started and didn’t let off until 1pm. Fortunately for us the trail was a cruiser and we made miles quickly. Unfortunately our hands got soaked and cold very quickly. Andy’s fingers were so cold he couldn’t open or close a ziplock bag. It poured as we walked through the forest, over puddles and through meadows. Our shoes and socks were soaked. We appreciated the wood planked boardwalks over the most swampy parts of the trail. The trail suddenly ended at King creek. We could see it continuing on the other side and found a large log to walk across. The log was wide and secure but being 5 feet above the water both of us initially froze. It takes some time to work up the courage to cross something that high off the ground when water is rushing underneath. Staring ahead rather than down made it easier and after a short while we both made it across safely. When the rain finally took a break we stopped for lunch. It was too wet to dry anything out but at least we were dry. 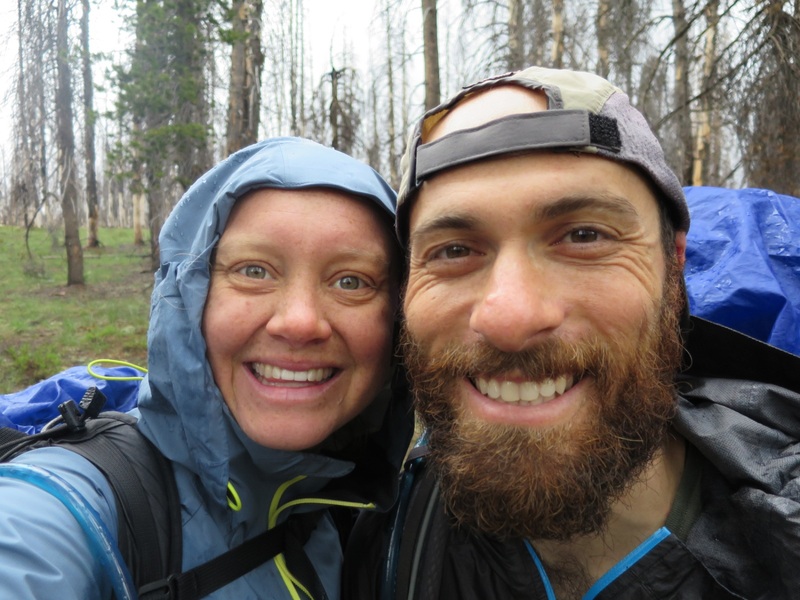 We talked about hiking in the rain and how we hope it doesn’t last weeks on end. Laurie doesn’t like being cold and soggy. Andy tolerates it knowing it is temporary. He appreciates its beauty especially watching raindrops fall on a lakes and puddles. We passed by many lakes today, all of which were tucked away in the trees, but close enough to see the rain ripples. Unfortunately it was too cold and gloomy to take a dip. Around 2:30pm the sun finally broke through the clouds. There were many dark storm clouds in the area but we decided to dry out our tent fly for as long as we could. We took our shoes off, sat on a rock and ate a block of raw goats milk cheese. Fifteen minutes later we could see the dark grey clouds getting closer and closer, so we put on our socks and shoes and got ready to go. 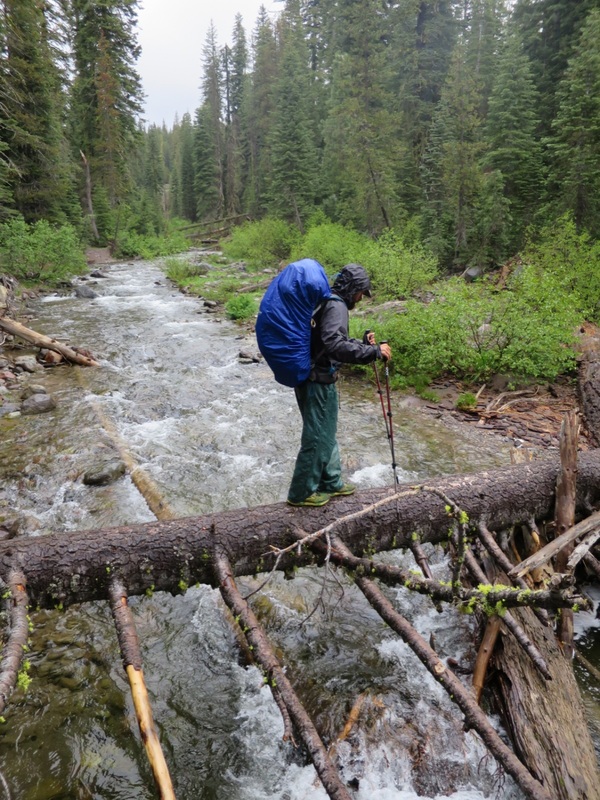 As we shouldered our packs it started sprinkling and then shortly there after, pouring. 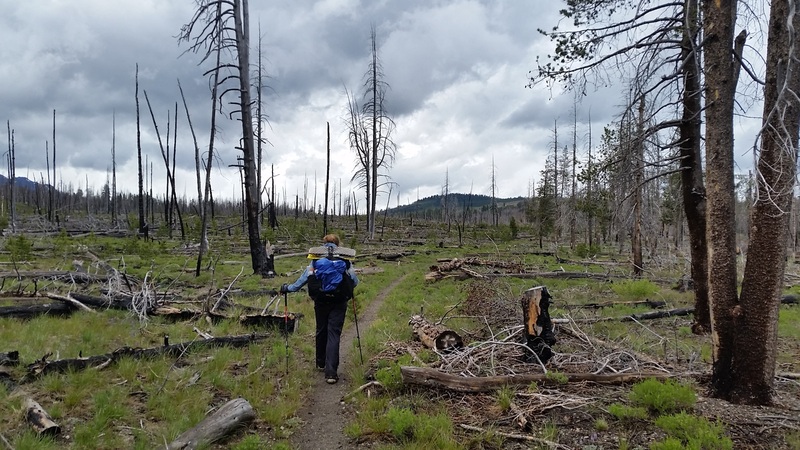 We decided to push on to Hat Creek – another 4.5 miles away to make our hike into Old Station tomorrow shorter. We’re a fan of challenges and hoped to be at camp by 5pm. Well, we beat that, arriving around 4:30pm. We loved the trail into Hat Creek. It was like walking through a magical forest. It was quiet, but not eerily so. The colors were vibrant. Green and brown grasses rustled in the wind and golden brown pine needles crunched under our feet as we walked beneath big pine trees decorated with neon green lichen. We expressed to each other that if we didn’t need water we would have loved to camp here. The ground looked soft and inviting. But alas, we kept moving. It was spitting rain when we arrived at camp so we went to get water before setting up the tent. 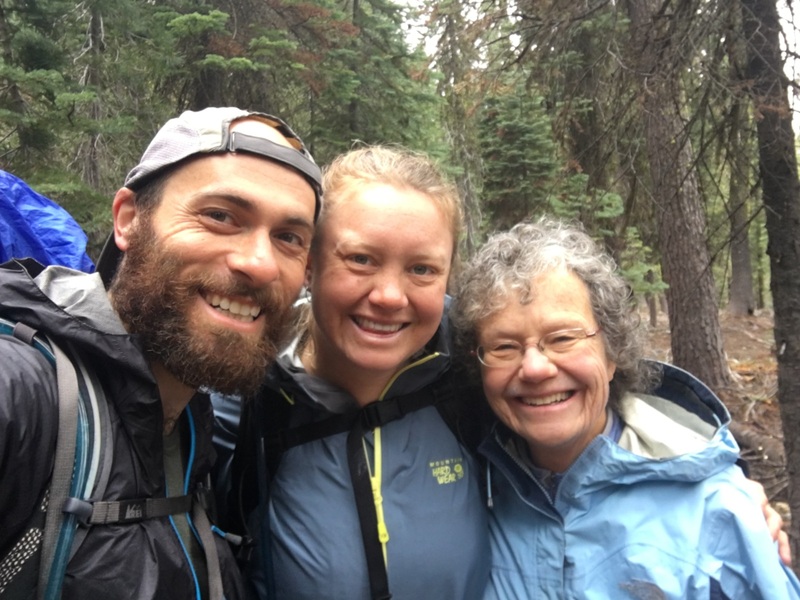 When we returned from Hat Creek we saw a familiar hiker near our packs. It was Phil! We’ve been wondering where he was and how he was doing. Now, he’s camped near us and it was great catching up with him. 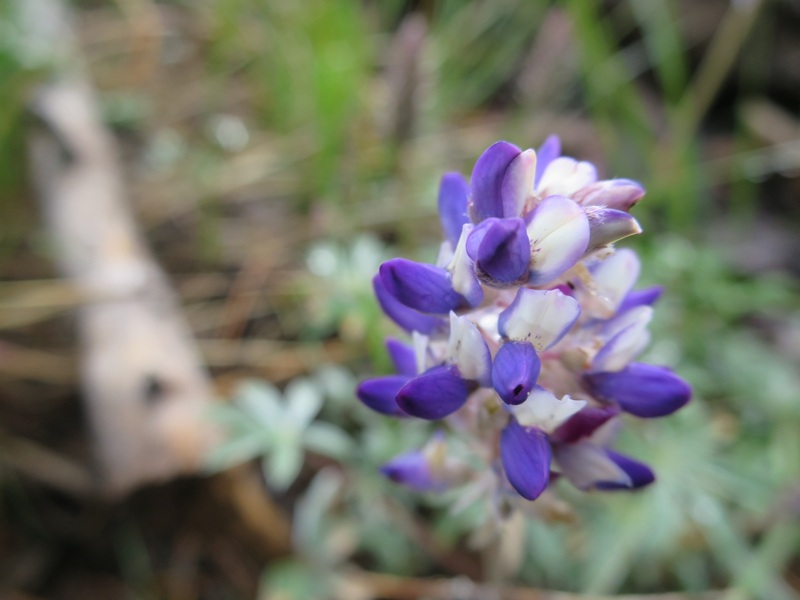 He plans to hike to Kennedy Meadows, then return to Oregon and hike north. Go Phil! After attempting to make hot lemon ginger tea with dehydrated lemon and GinGins ginger candy, we had dinner. Andy was really excited about his sardines and practically wolfed them down with his buckwheat. Laurie though was having a tougher time putting her food down. She wasn’t hungry but knew she had to eat. So she pulled out some nori sheets and finished her beans. Then she proceeded to eat a third of a bag of Jelly Bellys. There always seems to be room for candy! We’re definitely eating a lot more these days, especially Andy. We’ll see if this continues over the coming weeks or if it’s just a temporary phase. The rest of the evening Andy spent writing, editing and looking at pictures while Laurie took a nap. It’s hard to leave the tent to brush up or pee or do anything with the on again, off again rain. It’s especially difficult for Laurie. She loves to get cozy and finds it very difficult to get out again once she is in her sleeping bag cocoon. She’s had to pee for 4 hours now but has yet to leave the tent. Tonight we are grateful for boardwalks over marshy trail and sunshine on a rainy day. OK, I said happy birthday on your last post, not knowing there was another in my in box. Happy birthday, again. Interesting post, as always. Happy Birthday Dear Andy: What a marvelous adventure you and Laurie are sharing. Continue having a glorious most memorable trek . Be happy and healthy . This is a life altering trip for the two of you. So enjoy reading your blog and seeing your smiling faces as well as the ever changing scenery. Hugs to all three of you including Susi.